Off of the Red Square a long, squat-looking complex of buildings inhabits most of the street. Behind the building walls four onion domes of a church emerge, and a small sign welcomes you to the church cafe. 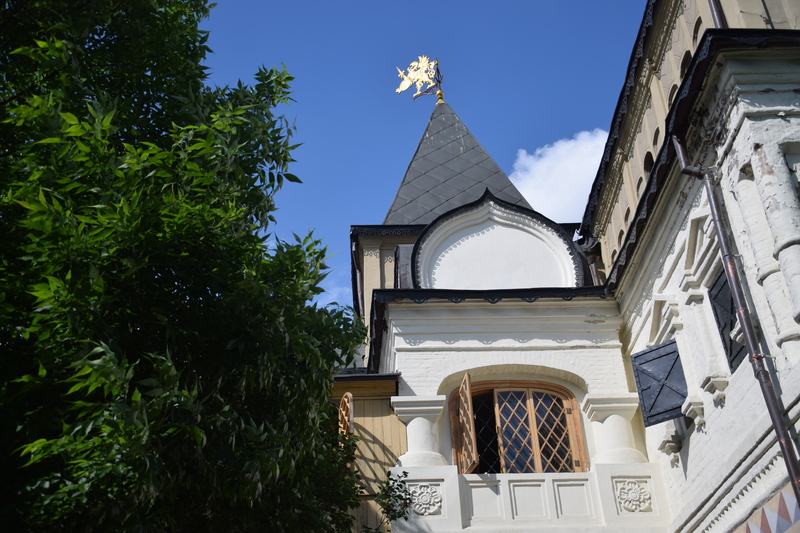 Further along the roof is topped with a golden emblem of a Griffin, the only obvious indication that you are standing in front of what used to be the Romanov’s home. Before they became Tsars, the family, which was part of the boyars (or nobility), lived here, in close proximity to the Kremlin. One of the only buildings to be built with mortar and brick when it was erected in the 17th century, it is the oldest standing home in Moscow. Quite a bit has changed though- when the Romanovs moved into the Kremlin the family chapel remained, and so the living quarters were taken over by the priests. Nowadays the religious establishment shares the complex with a museum, run in conjunction with the Historical Museum- the famous one on the Red Square. The museum itself consists of several small rooms over three floors, with some high, steep stairs in between. 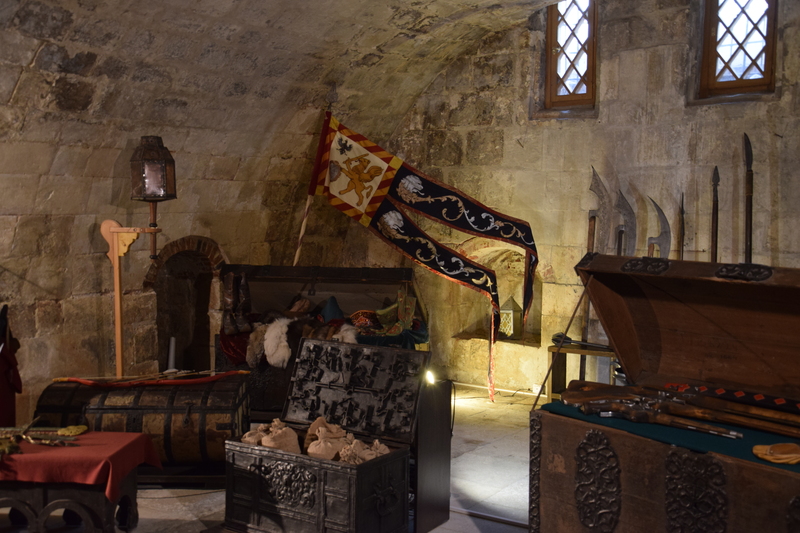 Starting in the ‘cellar’ you get to see the kitchen, with an intact oven, a larder and a weapons room. The oven, which heated the entire house by letting warm air into the walls, was particularly interesting because it also functioned as a bed in the coldest part of the house. These servants quarters are connect to the larder and the weapons room, which have been carefully arranged for visitors to admire both traditional Russian belongings and valuable imported goods from Italy and the rest of Europe. Progressing up the stairs you learn that the boyars lived a life of separation, and so the next floor up is the ‘male floor’. With displays of studies, libraries and a feasting table, the Museum attempts to show visitors typical activities during a guests’ visit. The men would eat at a table with a clear hierarchy, where the best food was served at the head of the table, and everything was eaten with their hands. After dinner, the men would show off their library, discuss literature and talk. It was at this point that the times and origins of all of the things in the museum started to get confusing. The room layout and central structure was the ‘original’, but the books, wallpaper etc, was as well. 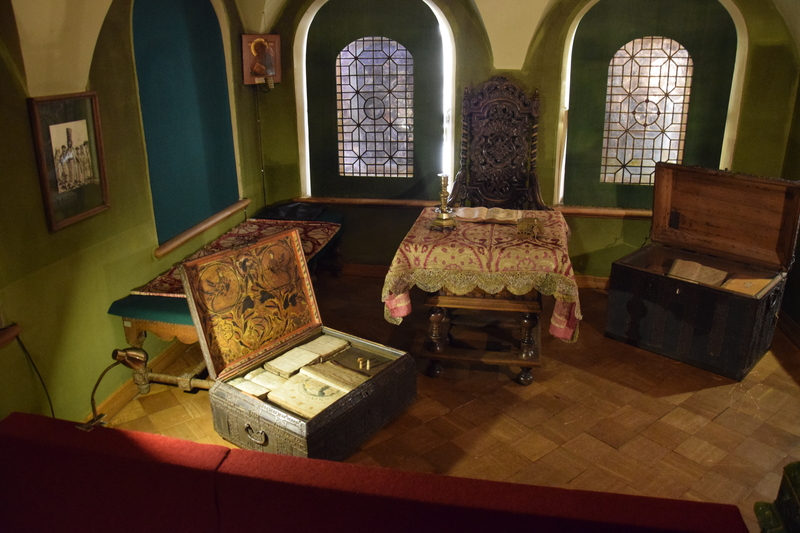 The distinction that had to be made was that one was from the 17th century, the other from the 18th, and in fact all of the possessions on display had not belonged to the Romanovs at all- they were examples from other Boyars that had been donated to the museum. We were therefore looking at around two centuries of history all moulded into one. Our guide pointed out the special utensils (knives and forks did exist) which were only used when the Tsar was guest. She also drew our attention to the well-hidden stairs that led up to the women’s quarters. On the top floor the rooms were larger, and significantly lighter. The three rooms were used to show a ‘living space’ much like today’s living room and a work space, where girls spent all of their time making their dowry. We learned that wives were chosen by the men’s family based on her possessions, which were carefully documented and stored in a large chest. This tradition only applied to the nobles, however, and (as she suggested with the example of Peter the Great), led to more than one unhappy marriage and former wives entering the convent. The tour leads back down the steps to the studying areas for the boys, who learned languages and literature before anything else. Boys moved downstairs away from their mothers at age six to commence their studies and prepare for their adult lives at court. Here you hear about the dramatic change that has occurred in the house since the Romanovs moved into the Kremlin. The building used to be a far larger entity, comprising the church (which was a family chapel), and surrounding quarters. It also used to have wooden ‘extensions’ which acted as bedrooms. The building must have been incredibly impressive in its time, especially in a city made almost entirely out of wood. 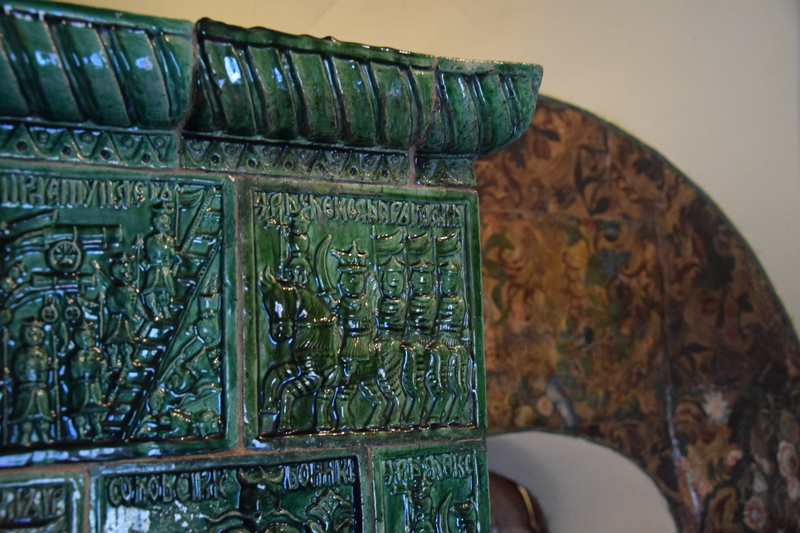 Now, the museum gives a quick impression of noble life in Russia- one that starkly contrasts with the pomp we have learned to expect from the grand European country homes. Perhaps it is no wonder that Katherine the Great felt so alienated in Moscow, where customs were so different from her Polish homeland and beloved St. Petersburg. For your visit: A keen observer to the Historical Museums’ website will notice that the change between Russian and English sites is dramatic, with the Russian website indicating four buildings open to the public, and the English website focusing mainly on the entity on the Red Square. This is in part because the other museums have not yet been fully prepared for foreign-language tourists. Although there are English pamphlets in the different rooms and we managed to get an English tour, it was clear that this was unusual. If you are interested in visiting this building, either be prepared to do some research yourself to understand more about life at the time, or contact the museum in advance for an English speaking tour. Tickets: 400 RUB for adults, 200 RUB for students. Our tour was free.